In mid-April of 1862, John Parke’s Brigade of the Burnside Expeditionary Force had begun a slow, steady movement to close the noose around Fort Macon on the Bogue Banks of North Carolina. Parke’s troops had earlier captured the coastal towns of Morehead City and Beaufort before crossing the Bogue Sound to begin the investment of Fort Macon in March of 1862. General Burnside understood that the fort prevented full Union control of the Beaufort Inlet, a key route for facilitating the sustainment of operations in North Carolina. Located on the eastern tip of the 21-mile long Bogue Banks barrier island, the fort was strategically placed to protect the approach through the Beaufort Inlet Channel to the mainland of North Carolina. The pentagon shaped masonry fort contained twenty-six casemates and its outer wall averaged better than four feet of thickness. Construction on the structure had begun in 1826 with the first garrison arriving in 1834. Robert E. Lee had been assigned to help correct the erosion control problem faced by the fort in the 1840s. Within two days of the Confederate bombardment of Fort Sumter, South Carolina on April 12, 1861, North Carolina forces had seized the fort and claimed it for the Confederacy. As Parke positioned his forces for a final assault against the fortification, a 27-year old Confederate Colonel named Moses J. White prepared his 400 defenders to meet the Union troops. Colonel White, a native of Mississippi, held an impressive record at the U.S. Military Academy in the Class of 1858 graduating second. Originally assigned to the western theater at the beginning of the war, he was given command of Fort Macon on October 5, 1861. During the siege, White struggled with health problems that had first appeared during his time at West Point. However, he continued to encourage his officers and soldiers during the Union bombardment until he was completely exhausted. Even though he was hopelessly surrounded and his men were exhausted, Colonel White refused to surrender the fort. The opposing commanders at Fort Macon, James Parke and Moses White. 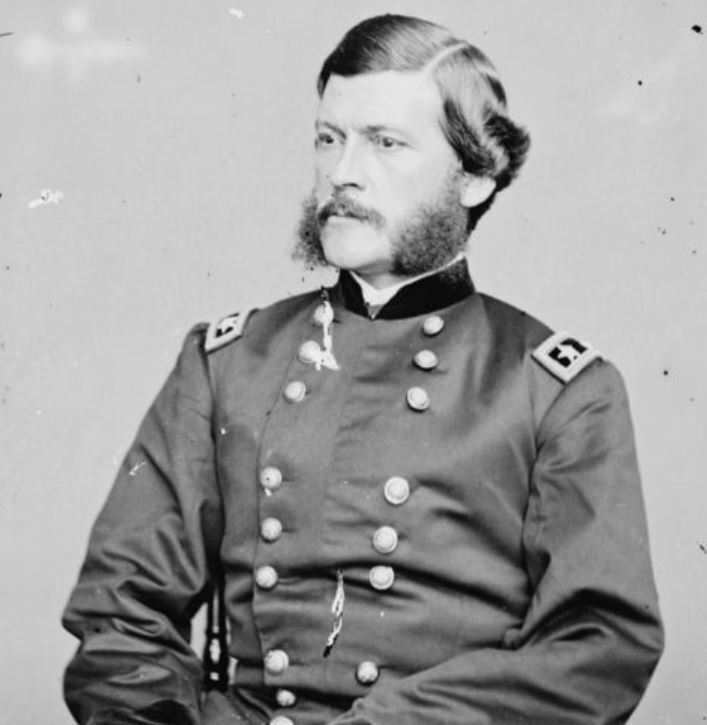 Like Confederate Colonel White, the commanding officer of the 8th Connecticut, Colonel Edward Harland, was sick and, by mid-March of 1862, he had become bed-ridden with typhoid fever. Under the command of Major Hiram Appelman, the regiment was divided into three parts to support the operations against Fort Macon and the coastal cities. Two companies were sent to occupy Beaufort and a few of the other companies were sent to secure Morehead City. The remaining companies including Company A crossed over from Carolina City to the Bogue Banks to begin movement toward Fort Macon. Private Oliver Case of Company A had been on picket duty seven miles away from camp near Carolina City when his company departed without him. As Case caught up to his fellow soldiers over on the Bogue Banks, there was much work to be done in preparation to lay siege to Fort Macon and its Confederate garrison. On April 12th, the 8th Connecticut, still under the command of Major Appelman, led Parke’s Brigade in forcing the Confederate defenders to withdraw into the confines of the fort. Major Hiram Appelman, now in command, marched his regiment by the right flank up the beach, and, when within three miles of the fort, filed across the island in line of battle. Company G, Capt. James L. Russell, was thrown out as skirmishers; and the regiment waded forward knee-deep in the yielding sand. The rebel skirmishers contested the advance, but were driven steadily back; and, while they retreated, they shouted, with absurd inaptness, “Come on, you d__d Yankees! we are enough for you !” Company H, Capt. Sheffield, was now deployed to skirmish; and the captain was severely wounded in the body. The exultant rebels continued to move back until they entered the fort; the Eighth having passed through a cedar-jungle, about a mile from the fort. Colonel White, likely realizing that he was being trapped in the fort, took the unusual step of conducting a night attack in an attempting at breaking the developing siege. As the 8th Connecticut began to construct defensive positions in case of a counterattack, the Confederates stuck the regiment with the cannons from the fort. The enemy made two ineffectual attempts at night to dislodge us from our advanced position, in one of which Lieutenant Landers and a private of the Fifth Rhode Island Battalion were slightly wounded, and in the other Major Appleman and a private of the Eighth Connecticut Regiment received severe contusions from a discharge of grape while digging rifle pits within 750 yards of the fort. Oliver’s letter of 17 April 1862 does not comment on this operation carried out by the 8th. He does describe the work being done to affect the siege of Fort Macon. Some of the companies are detailed each night to help build entrenchments and I think that by three or four days at farthest we shall open fire upon the fort. The mortars and field pieces are nearly all in position, and part of the howitzers. Oliver’s prediction is fairly accurate because the siege will begin in about 7 days. In the meantime, life on Bogue Banks is filled with the work of preparing positions for mortars being floated across the sound. The guns were moved up the island at night to avoid detection by the Confederates within Fort Macon. Protected firing positions were constructed for the guns using sandbags. Conditions were difficult for Oliver and his fellow soldiers as they worked. The Eighth Connecticut Volunteers and 4th Rhode-Island were alternately on duty; when off duty, occupying an uncomfortable camp down the island. Rifle-pits were dug at night within two thousand feet from the fort, and constantly occupied. In front of them, in storms, the sea surged over the island. The sand was so movable, that the men were sometimes half covered. The firing positions constructed by the 8th Connecticut and the 4th Rhode Island would prove to be very effective during the final attack against the fort and by the 23rd of April, Burnside determined that it was time for the final assault. He once again offered Colonel White the opportunity to surrender the fort with generous terms including the parole of all the Confederate defenders. As with previous demands for surrender, the young Confederate commander refused to accept the terms and prepared his soldiers to defend the fort. In the early morning hours of April 25, Parke ordered the bombardment to begin in earnest. As the land-based Union guns began to fire on Fort Macon, several ships from the Blockading Squadron appeared near the fort and attempted to participate in the shelling. While the Navy had not been included in the planning for the reduction of the fort, Commander Samuel Lockwood responded to the sound of the artillery. However, the four ships were unable to bring effective fire on the fort due to rough seas and soon abandoned the effort after two of the ships received minor damage from Confederate counter fire. The Union guns ashore were initially wildly inaccurate doing little damage to Fort Macon during the few first hours of the assault. After Union Signal Corps officers in Beaufort established communication with the gun commanders on Bogue Banks, they were able to accurately direct the mortar fire so that by noon almost all shots were on target and the fort walls began to crumble. In response, Confederate gunners attempt to counter the fire from the mortars, but the protected positions among the sand dunes limited damage to the Union guns. As the bombardment continued into the early afternoon, Confederate guns in the fort were damaged and destroyed and Colonel White realized that he could not hold out much longer as the powder magazine was in great danger of being hit. By 4:30 in the afternoon, Colonel White raised the white flag of surrender and the bombardment was halted. Fort Macon would soon be in Union hands. OR, Parke, May 9, 1862. This entry was posted in Burnside Expedition and tagged Bogue Banks, Burnside, Fort Macon, James Parke, moses white, North Carolina. Bookmark the permalink.